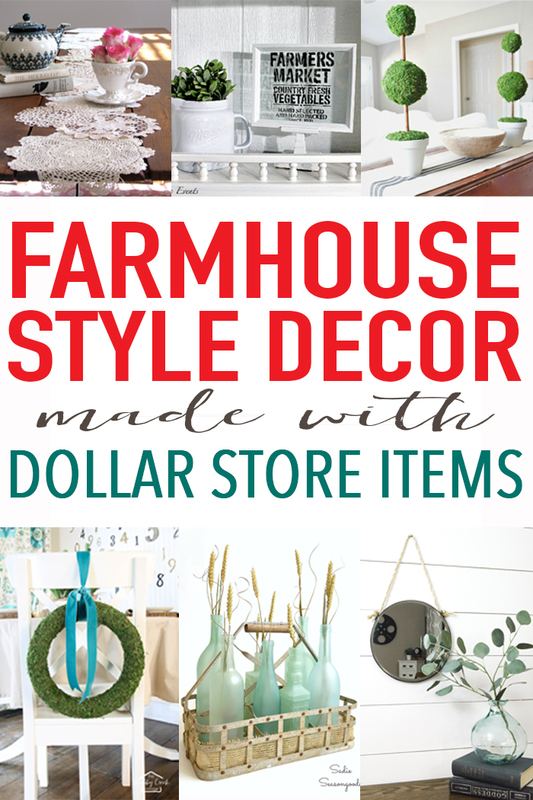 Stop by the dollar store and grab everything you need to fill your home with charming farmhouse decor – without breaking the bank! Am I the only one that walks into those fancy home decor stores and is scared half to death I’m going to break something? 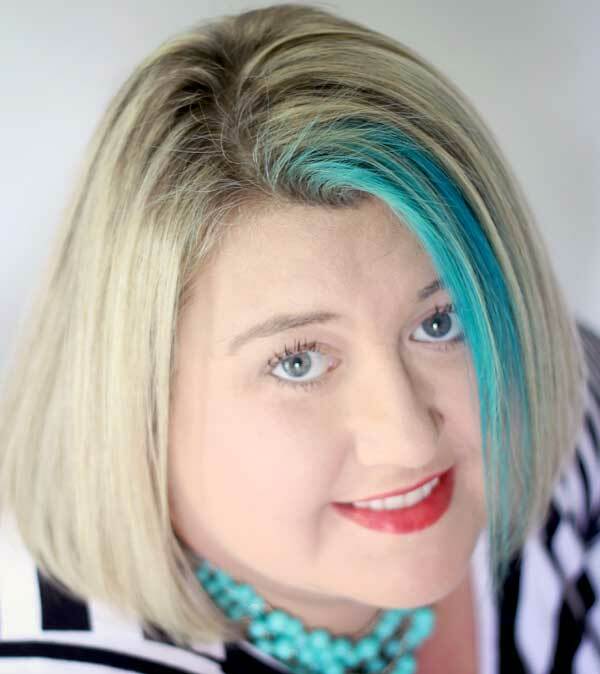 Shopping is fun – but between the “bull in a china shop” anxiety and the prices, it’s enough to make me need a cocktail. 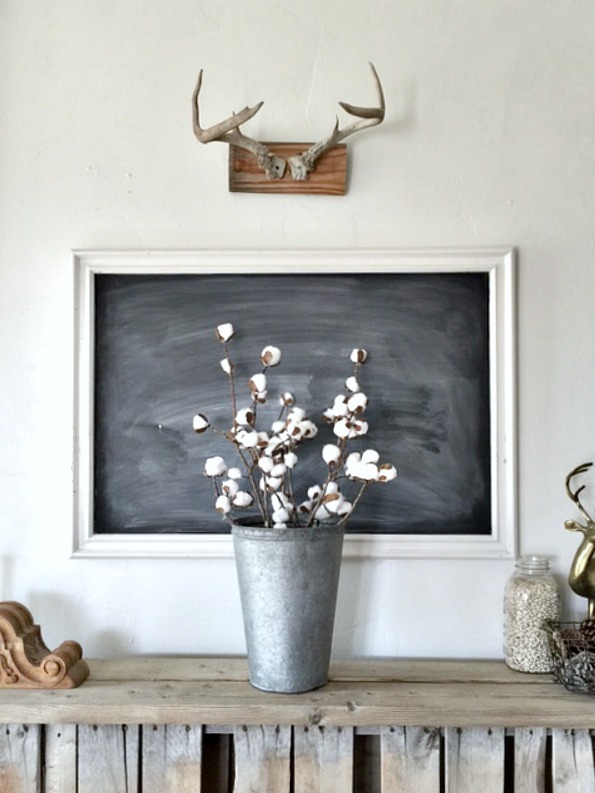 Because I’d much rather shop for things to DIY my own farmhouse decor. That’s totally more my speed. 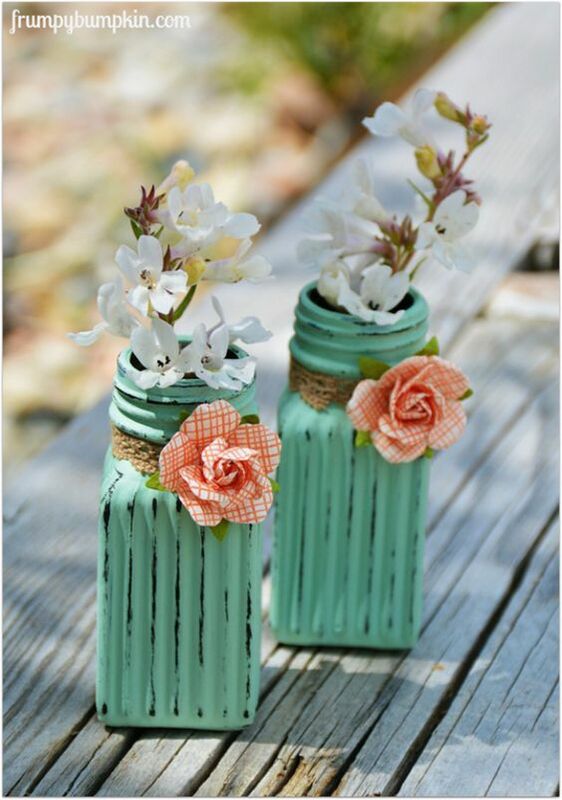 So let’s take a trip to the dollar store – and YES – you can totally make every one of these farmhouse decor ideas from the dollar store! 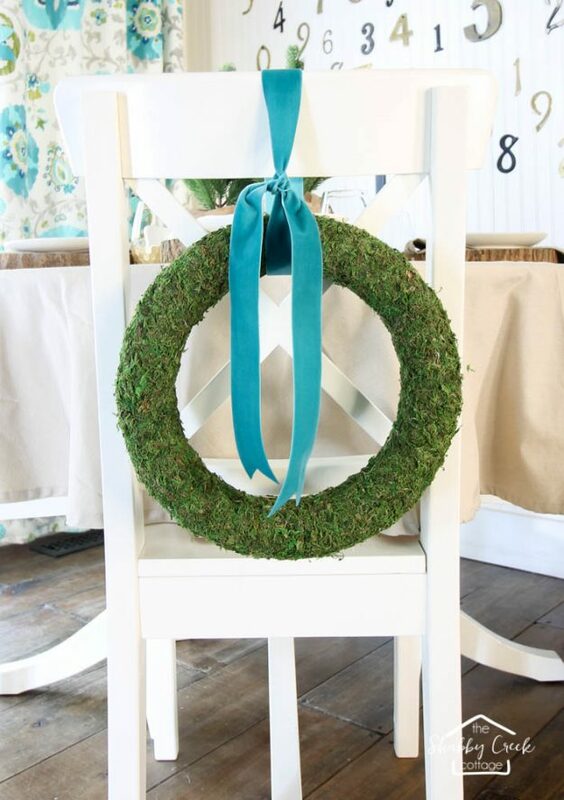 Grab a couple of supplies from the craft section to make this pretty moss wreath. I’ve seen them sell for up to $100 – but I made these for less than $2 each! 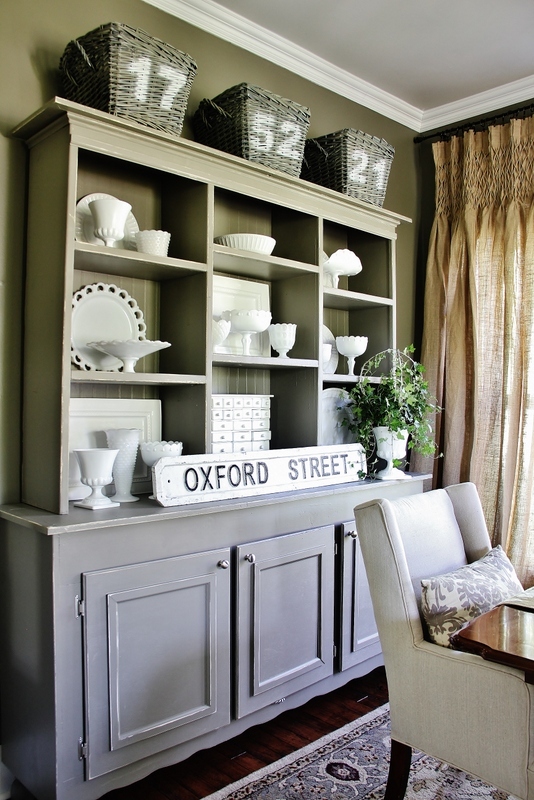 Want to go a little fancier with your farmhouse decor? 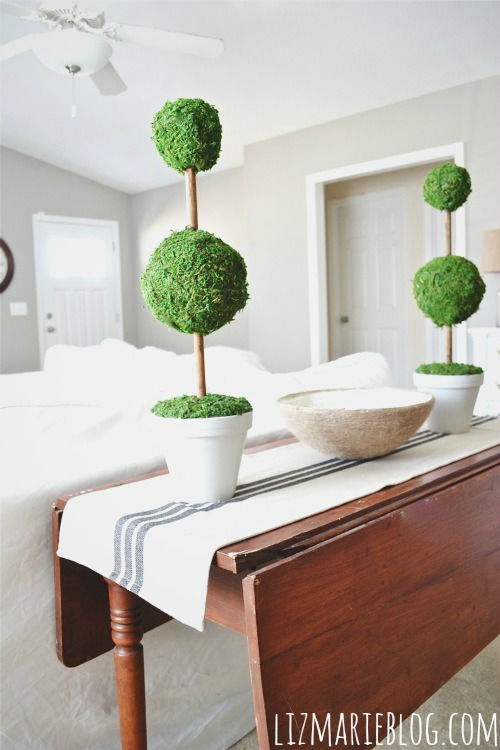 Grab a terra cotta pot, some dowel rods, foam balls and moss at the dollar store and make these moss topiaries like Liz Marie did! 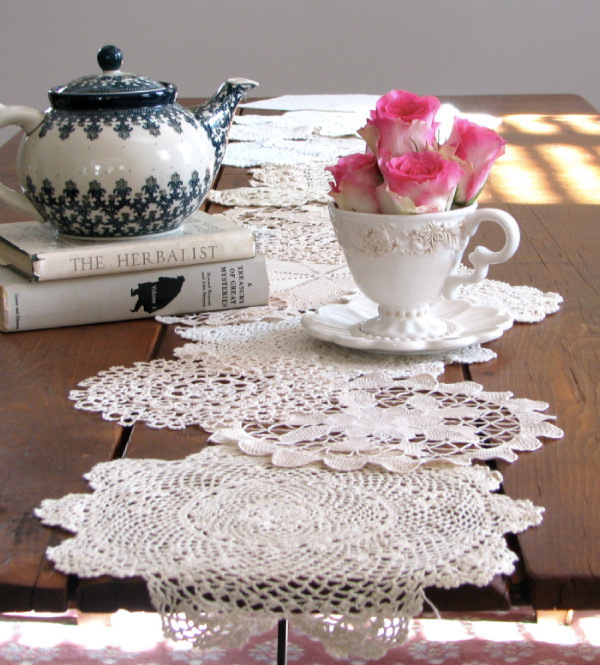 I’ll never look at doilies the same after seeing how you can turn them into this pretty table runner! 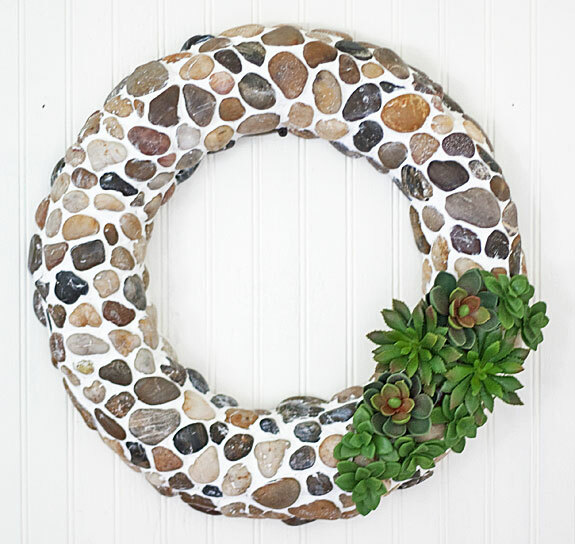 Don’t skip over the rocks, grab a few bags and make this pretty wreath – you can often find the succulents and the wreath form there, too! 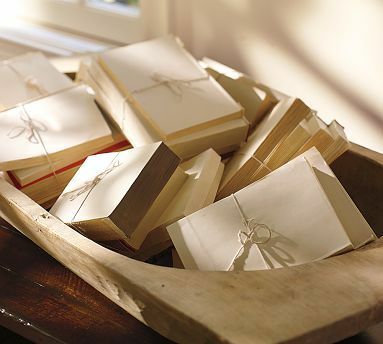 Major home catalogs have been using unbound book bundles as props for years – and for good reason – it’s a cheap way to make a big impact! 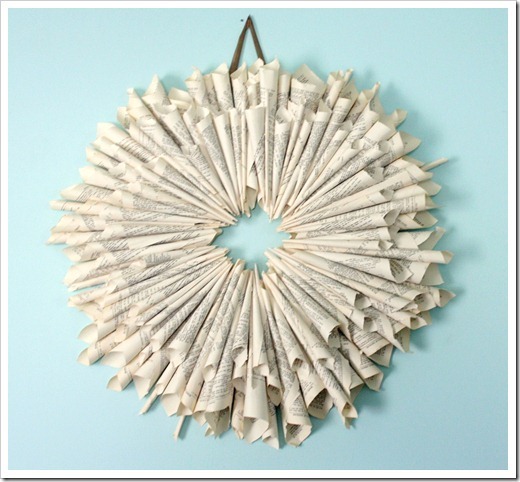 Grab a few books from the dollar store, rip the covers off, tie them together with some jute twine, and you’ll have fancy looking farmhouse decor for next to nothing! 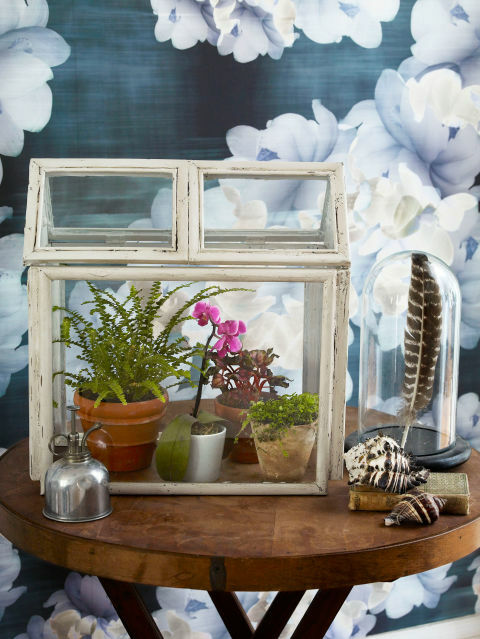 Want to get a tiny bit fancier? 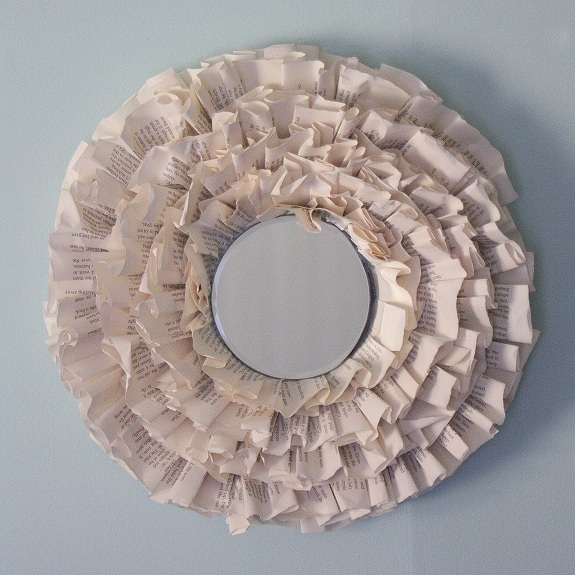 Grab a little candle mirror while you’re there to make this stunning ruffled book page mirror in no time! One of the best buys at any dollar store are the bins and baskets – which is great because they are perfect for making farmhouse decor projects like this mail sorter. This makeover couldn’t be any easier… a simple stencil and a bit of paint and you’ll turn those plain baskets into rockstars like Karianne from Thistlewood Farms. 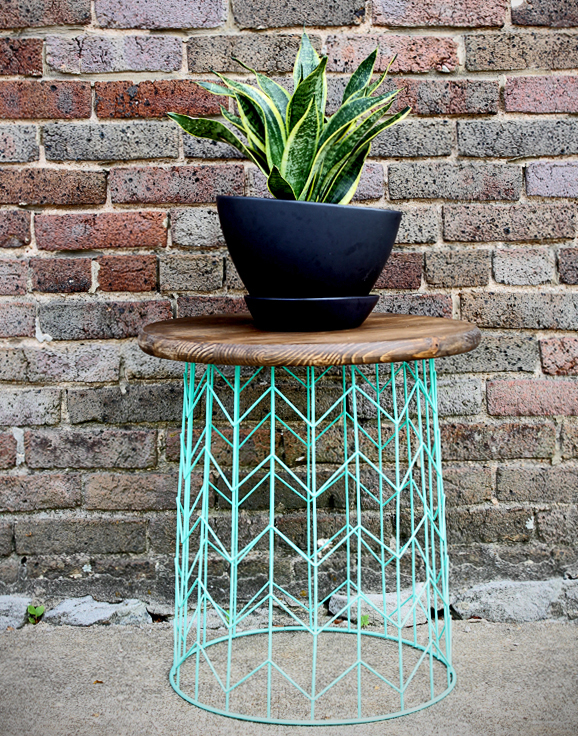 Every once in a while I’ll get lucky and find larger baskets at our dollar stores – and they are perfect for making projects like this wire basket side table. It’s been quite a while since we have had a stove with “eyes” on it to need burner covers, but this gorgeous captain’s mirror idea from Katie at Little House of Four means I’ll never look at them the same again! 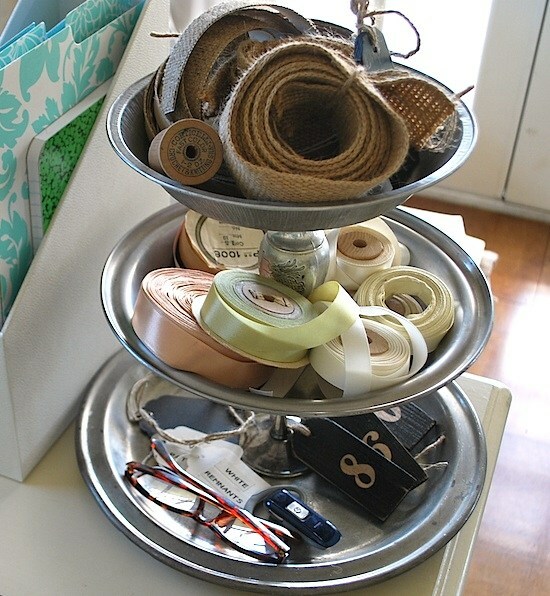 While you’re hanging out in the dishes dept – make sure to grab a few pie tins, then pop back over to the candle sticks and grab a couple to make this cute tiered stand. 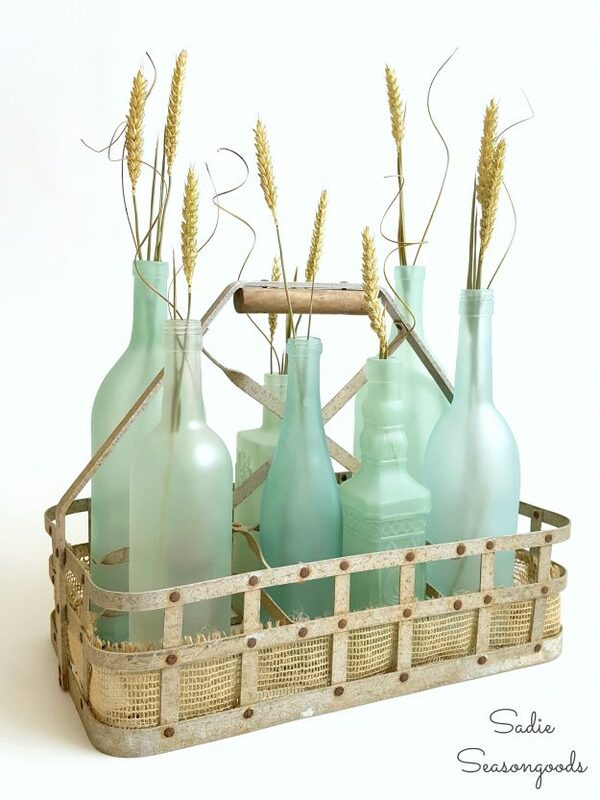 Finding glass bottles is pretty easy at the dollar store – and they can make for some beautiful farmhouse decor if you give them a few coats of paint like Sarah. 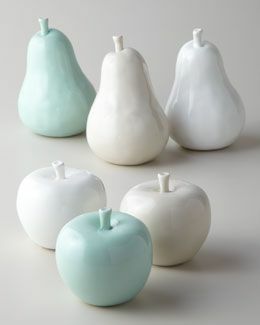 Variety is the spice of life – so grab those salt and pepper shakers and shake up their look with a few coats of paint. Don’t pass up that faux fruit! Give it a few coats of high gloss spray paint to give it a whole new look. What do you get when you put together a candle stick, a vase and a candle? 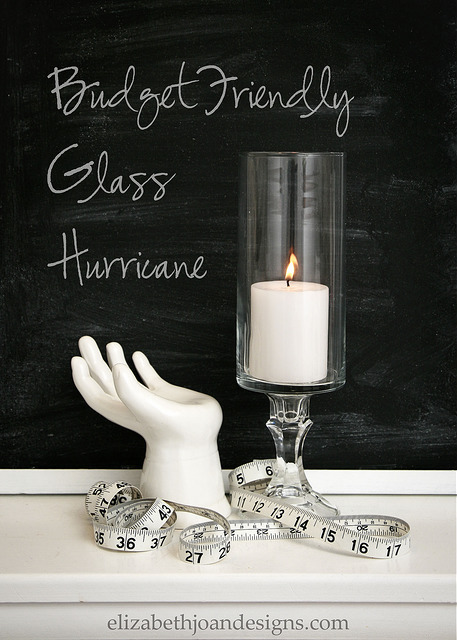 A gorgeous hurricane that looks like something from Pottery Barn – but it actually came from the dollar tree! 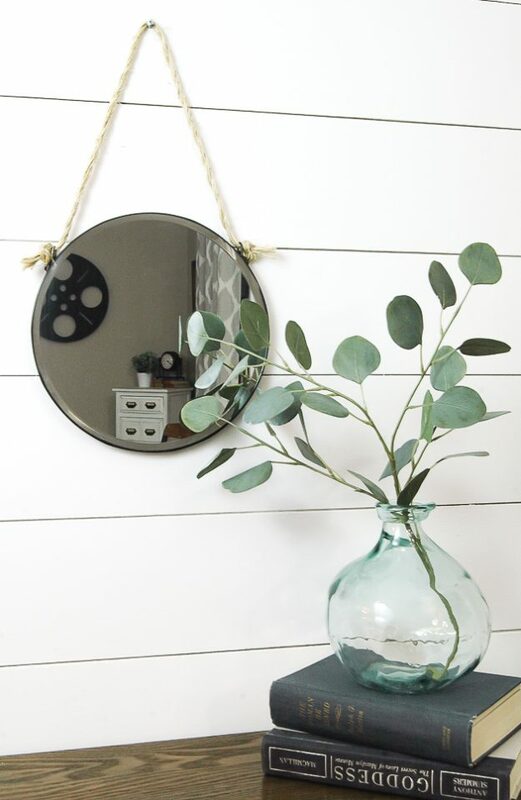 While you’re perusing the home decor section, don’t forget to pick up a few picture frames – because there’s a ton of gorgeous ways to use them. 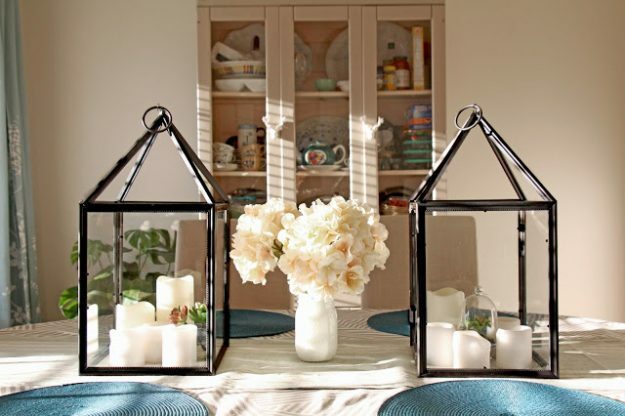 Kathleen from Grosgrain made these gorgeous lanterns with 5 frames – genius, eh? 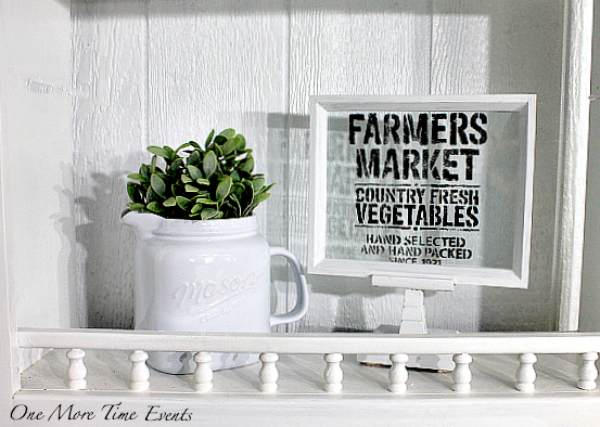 Add a frame onto a candlestick, and with a little paint you can make this cute farmer’s market sign like Tammy at One More Time Events did! 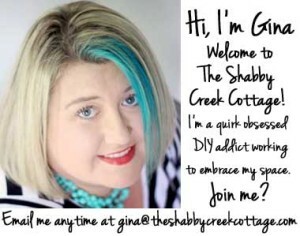 Fab post, Gina! 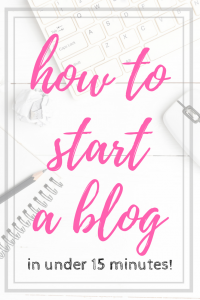 I love finding so many great ideas in one spot … and with bargain (to say the least) supplies! Thank you so much Kathy, you are so sweet!! Really loved all your ideas. Please share all you like 🙂 So glad you like it!! Thanks so much! Thank you for the awesome ideas! Will be making a trip to the dollar store.